I cannot believe we are going into February already! Where on earth did January go? When I think of February I think of the color red since Valentine's Day is celebrated mid month. Red is the color of love and if y'all have followed my blog for any length of time then y'all know this chick loves red. When I first started blogging all I was seeing was neutrals and whites and I loved that look, too. So I tried to cover up the red in my house with slipcovers and was trying to slowly weed out the red to conform to the trend. Problem was I didn't feel right in my own house. The look wasn't me and the slips went away and the red came back. You can check out that very old post Here to see when I had added slipcovers. Just excuse the photography. Today I'm sharing some photos from my pinterest board and from my own home to show you some ways of decorating with red. 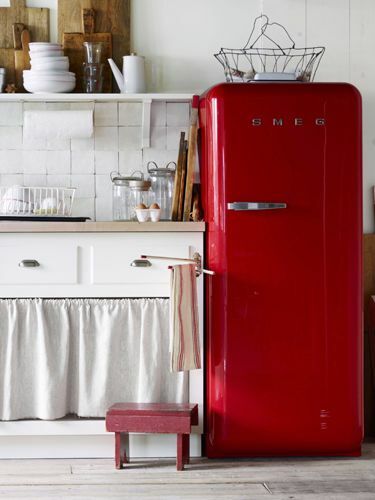 How about a fun red retro fridge like this one at Country Living? I have learned to decorate with what makes me feel good and not to get caught up in trends that come and go. If a certain color makes you happy then use it. I promise the design police won't lock you up. To see more ideas using red check out my pinterest board. I have added red recently to a room that I don't normally have it in. 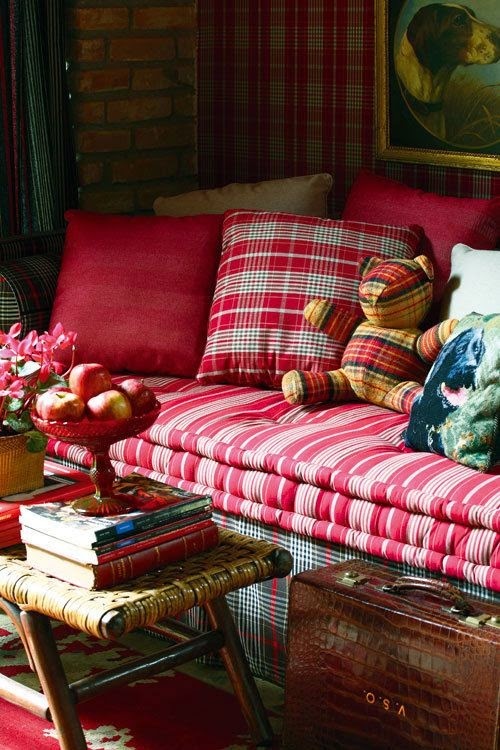 I love how you use red, especially in your sunroom (my favorite room in your home)! I've got splashes of red around here, too, for Valentine's Day! I can't believe January is over ... bring on Spring! Kim, we love red here, and not just in the month of February. Thanks for posting. It is the perfect pick-me-up for this grey, cold winter day. Kim, I love how you stay true to yourself in your decorating. I have been drooling over that red island ever since I saw it a few days ago. From one red lover to another! The colour red and yellow make the room pop! I love your sunroom and that red lamp! Kim I love the little touches of red you have around your home. Just the right amount to add drama! But talk about drama...that red vintage frig is a real eye catcher! Wow...love it all. Thank you so much for posting this...have a great evening! Kim, I love the red accents in your home! Mr. Savvy's curtains are still my favorite! The inspiration photos are wonderful too! Thanks for sharing! What great inspirational photos! I've married and broken up with red a couple of different times. We're married again. :) The one red wall in our home is in between the living room and kitchen so both of those rooms have bits and pieces to pull it all together. I suppose red and I will remain married since I've started collecting red and white transferware. Wow - I just finished a post about adding pops of red in a room! Your red and white check curtains are my favorite and that red fridge - I want one!!! I love red! It's my favorite color and I use it all over my house. I have a few bits of red still in the house, but they are not as great as my old red sofa. The first time I decorated with red was for this Christmas and it was fun to use the red. 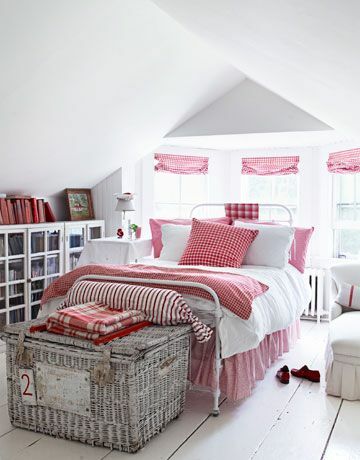 I love that inspiration photo of the red and white bedroom. Sooooo pretty. Love that red in your sun room Kim. I've always had red in my kitchen, not so much in the rest of the house, not sure why since it makes me so happy! I could not agree with you more. We should all decorate with what WE love. After all we have to live in our homes. I Love all the red in your home, Kim. I am a color person too, We are going to start painting soon and I can't wait to get some color on the walls. Happy Februaury!!! Count me in with you - love red. We're the only house in Portofino with bright red front doors on our gray house and potting cottage. I too moved to more neutral colors in the main living areas - gray, cream, back and white as I like high contrast. Now I am finding that red accents are sneaking back in (such as in our shared violin girl art) and in the new fabric bought today for pillows. Love your sunroom especially that Pottery barn chair with the tiny red stripe and those classically fabulous red checked drapes - makes the room sing. Thanks for sharing those inspiration pics! I switch everything over to red every Christmas. After Christmas I leave the red up until springtime. Red is so warm and cozy for the winter months. living room and it is one of my favorite pieces of furniture. Love all the red you have in your home. Your home is soooooo beautiful. Love the red! Kim, red is my favorite color! I too have tried to embrace white and neutrals, but it is so lifeless! Love your home and style! Red, white, and aqua are my favorite colors to decorate with. Love your home and all your touches of red. Your home is always so lovely. I was never a fan of red in my house, although I admired it in magazines and other's homes. Then I went furniture shopping and found the couch I never knew I ever wanted! It is yellow with large red cabbage roses and red binding on the cushions. It turns out I do like red in my living room! The red is an accent, but it really brightens things up! I've always loved red and have it in almost every room in my home.......blue is my other favorite.........never been one to follow trends, just not me...........be true to yourself!! I love red! I want to replace my sofa with a red one. It is the one color that I am always drawn to. I think everyone has a go-to color that makes them smile. Sometimes we just have to grab hold of what we love and be non-trendy. Love all the red! It is done so tastefully. You have a beautiful home! It's Valentine month, and there's no better time to declare my love for red than now! It's a love affair that has never grown stale, and I'm glad that you reclaimed your passion for this pigment, too! Your photos showing its brilliance are enough for anybody to fall head over heels with this hot hue; thanks for sharing! Just like you when I started renovating the Cottage, I was influenced by the neutrals we could see all over blogland. But I've learned to create my own look, using seaside colours rather than only neutrals. It feels more me! I love how a touch of red immediately gives a sense of farmhouse style. i love your use of red in your home! I love red too. 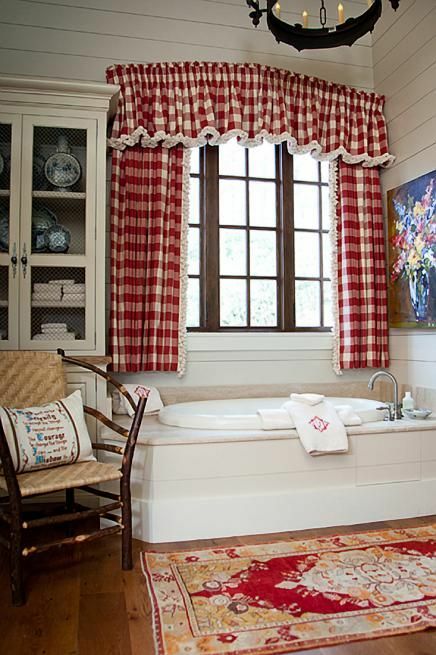 I love the red buffalo check curtains in your house! 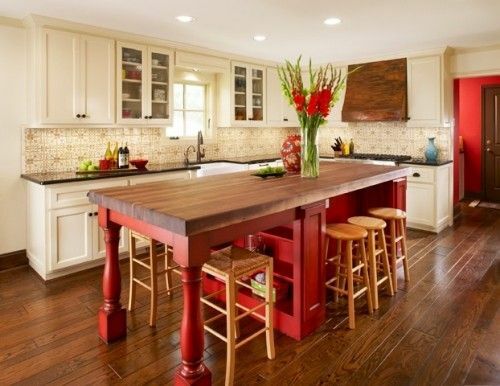 The red kitchen island makes me want to paint my farmhouse table legs red...my husband wouldn't like that though. I just have to use red elsewhere. And I'm with you, I love the white and neutral look but it doesn't work in my house. Glad I've reached the stage in life where I am happy doing things my way. Off to check out your Pinterest board. I like red too but there are times Im tired of it and put it away for a while, but like you it always returns to my decor with time. I love that red fridge but I think I would tire of it quickly. I am so with you Kim! I LOVE my red and can' imagine not having it in my home. But after painting my walls yellow in my last three homes, I am ready for some neutral wall color in my next home. I love all of your reds and the new colors you have been painting your walls over the last couple of years. I am off to check out your pinterest board. I have a friend with all red kitchen appliances and a big red plaid wall. It is such a fun room to walk into, after all my white and wood. Love red and it is my sweeties favorite color!...Great inspiration pics of beautiful rooms of red. Have a great weekend! Love red and white together and you do a great "RED" job! I love red too, but other than the holidays, I haven't had a lot of it in our home. I should, and your pictures and your rooms are inspirational! Hello Kim! I am ever so honored for my blog to be listed on your Savvy Friends list! That explains all the traffic from your blog! Thank you so very much my dear! I'm totally with you - I tried to go more modern and it just wasn't for me. The rooms never felt right! Beautiful inspiration Kim! Love the touches of red in your home. I agree I only like what I like.And I don't care if it's a trend or not. Kim I too love red, I always add red to my neutrals. I am head over heels on the red island. I told my hubby to add that to my dream kitchen.